What is the Library of the Future ? The event was organised jointly by JISC and the Bodleian Library, and was well worth my temporal effort not only for the content, which was highly relevant for my current module, libraries and publishing in the information society, (LAPIS, INM380), but for its exemplary use of web 2.0 technology as a communication tool. I was treated to a clear demonstration of what we all suspect is possible but never have the time to do – although you do need the resources of Oxford University to pull it off. Firstly, streaming video. Worked really well, and shy people were able to watch remotely from behind their computer screens, whilst the rest of us sat under the glare of the cameras from every angle. I could start about privacy here, in that it is now impossible to even attend a professional meeting without being captured on camera, irrespective of whether or not it is a bad hair day. 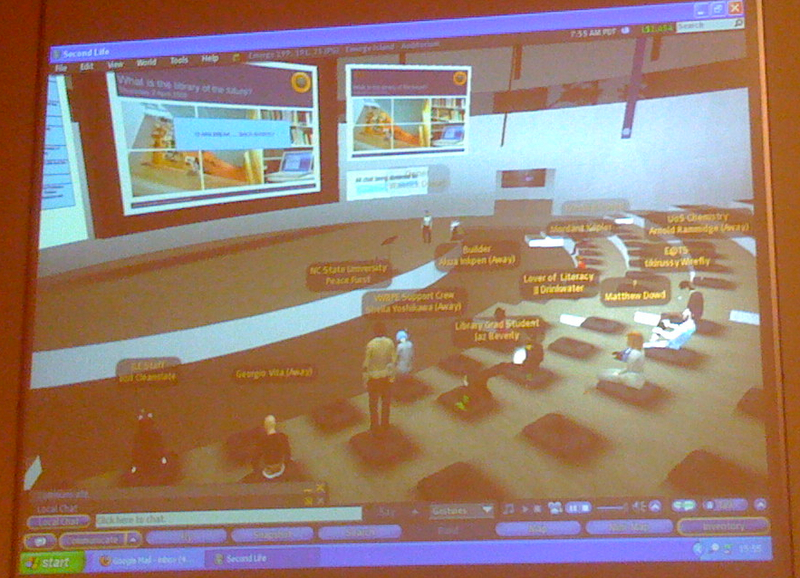 Nontheless, in addition to the video, virtual attenders could comment to the blog, tweet, or chirup from second life. There were about 30 second lifers and this was my first view of the cartoon world on the big screen. Brilliant – especially the guy with the glowing mohican hair who sat on the edge of the stage and the guy who I guess was smoking in a blissfully virtual audience. Masses to distract me from the actual presentations, which I believe will be added to the JISC event archive (videos, podcasts, ppts and pdfs). Good thing too as keeping one eye on the one liners from the stay at home commentators meant I kept losing track of what the speakers were saying – this stuff would really suit the attention deficit generation. I overheard someone complaining that twitter was just an outlet for adolescent rantings and un-funny wisecracks. Surprisingly I found myself silently coming down on the side of the one-liners – twitter at least gets people involved and honestly we cannot encourage the chat police – but I wonder if these endless viewpoints distract more attention away from the talks than they contribute? Anyway – back to the future. In essence it seems that libraries have to keep up with the expectations of their users or the users will vote with their feet. However, many users already rarely use their feet and remain firmly welded to their desktop keyboards when searching for information. There was some sense that users don’t know what is good for them, and that libraries must show them the way to search properly – but honestly, I have an idea that quite a few users do pretty well on their own. Peter Murray Rust gave a lively presentation (tweeter: “this guy is passionate..”) which demonstrated how users of scientific, technical and medical information were doing it for themselves by designing the information services they really wanted. This was backed up by a demonstration of several chemistry related services, and the excellent openstreetmap.org. Peter used his blog to showcase his presentation, rather than powerpoint, to good effect, so here is the link. Santiago de la Mora explained that Google was busy digitizing the contents of lots of libraries anyway, (“to improve search”), and that Google Books would open up new things for us to do with electronic texts of out-of-copyright books. A link in WorldCat alerts us to Googlised items, and an option to “buy now”. I did agree that this would open up access to the ‘longtail‘ of many customers wanting idiosyncratic items though. The Public Sector Perspective was given by Chris Batt (ex MLA Council) – a podcast of his views (recorded before the event) can be listened to here. There was lots more – but have a look at the JISC site for the actual presentations. But before you start thinking the future is now, today’s Times runs an article by David Rowan entitled “The suits come to Second Life. Now its dying“. Essentially, the avatar with the mohican is likely to be your lecturer. Time for the next big thing. This entry was posted in Opinion and tagged future, libraries, LIS, social-media, twitter, web 2.0 by Dr Lyn Robinson. Bookmark the permalink.